Background Dysphagia is a common complication after stroke. Water swallowing test (WST) is a recognised but limited tool in providing details about dysphagia, including severity and how to adjust the diet based on the test results. Methods We performed a prospective observational study of comparing WST and volume–viscosity swallow test (V-VST) in patients with acute stroke within 14 days. All patients had WST and if failed would have a V-VST. The primary outcome was to compare the dysphagia levels assessed by these two test tools. The secondary outcome was to explore the predictive capability in patients who were at high risk of pneumonia by these two swallowing tests. Results Consecutively 276 patients with stroke were enrolled in our study, and 197 had normal WST. 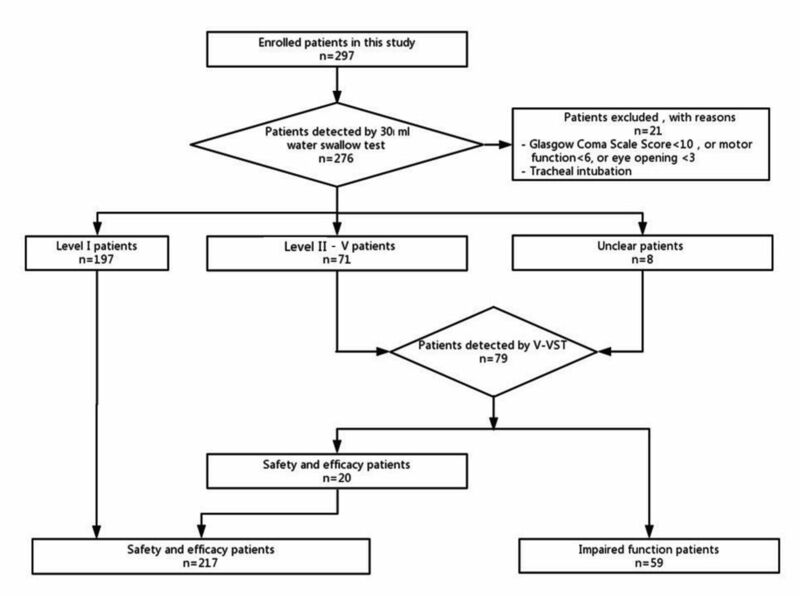 Among 79 patients who had both WST and V-VST, 20 showed swallowing safety and effectiveness by V-VST. The chance of being on tube feeding was strongly related to the positive results of failed WST (p<0.001). Both tests showed good predictive ability in patients with stroke for pneumonia even some of them were placed on tube feeding (p=0.001 in WST and p<0.001 in V-VST). Conclusions V-VST performed better as a clinical screening test for dysphagia in patients with acute stroke at the bedside. Videofluoroscopy (VFS) is a sensitive tool to assess dysphagia after stroke, but is unlikely to be done in each patient after acute stroke. Although VFS is the gold standard screening for dysphagia,4 a simple and sensitive bedside screening tool is much needed during the acute phase in patient with stroke. Limited evidence showed that V-VST was reliable in detection and diagnosis of dysphagia in patient with subacute–chronic stroke.12 Our study aims were to compare the outcome in detecting dysphagia by two bedside dysphagia screening tests in acute stroke patients. This is a prospective, single-centre, self-control observational study. All stroke patients admitted between July 1 and December 31, 2017 were eligible for enrolment. All were evaluated for swallowing function within 24 hours after their admission. Patients would be screened by WST first and followed by V-VST. All other data including demographics, stroke subtypes and clinical features were recorded and analysed. Participants were eligible if they were diagnosed with acute stroke (ischaemic or haemorrhage) and confirmed by CT or MRI, age >18 years, and within 14 days after stroke onset. We excluded patients who had tracheal intubation and a Glasgow Coma Scale score of <10 (excluded if motor function <6 or response <3). Patients were routinely screened by WST within 24 hours after admission before they were started on a diet. Those patients who achieved water test level I were concluded as safe and effective of V-VST. The patients who failed water test or unable to achieve WST (severe weakness and fatigue, unable to lift up a cup by himself) would be able to be tested by V-VST. The work flow was illustrated in figure 1. The work flow of dysphagia evaluation in patients with acute stroke. V-VST, volume–viscosity swallow test. Since V-VST provided the diet adjusted for tolerability, our primary outcome was to compare the ability of detecting swallowing problems between these two bedside tools, especially in patients already failed WST. The secondary outcome was to explore the ability of predicting pneumonia by these two swallowing tests. Continuous variables were presented as the mean and SD, and categorical variables were expressed as frequencies (%). Independent sample t-test and Kruskal-Wallis were used for analysis of continuous variables and chi-square test for qualitative variables. All the p values were estimated in two-tailed tests. Differences were considered statistically significant with p<0.05. All data were analysed using SPSS V.16 for Windows (SPSS, 1989–2007 Polar Engineering and Consulting). A total of 276 patients with acute stroke were prospectively screened within 24 hours after admission. Of them, 197 (71.38%) were male and 230 (83.33%) had ischaemic stroke. Most stroke (58.33%) were located in the partial anterior circulation as defined by the Oxfordshire Community Stroke Project (OCSP) classification. Mean National Institution of Health Stroke Scale (NIHSS) score in these ischaemic stroke patients was 5.26 (SD as 4.91). Among them, 179 patients achieved level I on WST which were considered as safe and effective. All patients failed WST were then assessed by V-VST. The comparison of findings between WST and V-VST in patients with dysphagia were demonstrated in table 1. Characteristics of patients who failed both WST and V-VST were similar (detail in online supplementary table 2). Among patients who failed WST, 20 out of 79 were identified as safety and effective by V-VST, while 30 out of 79 were identified as having either impaired safety or effectiveness. Patients who failed WST were distributed by V-VST as figure 2. In patients with only impaired swallowing safety or only effectiveness, they were given a diet with a food viscosity they could tolerate and devoid of a feeding tube.12 All patients with different severity of dysphagia were compared in table 2. Since our study was an observational study, results of V-VST were not offered to clinical physicians and affected on any clinical interventions results. We found that patients who failed WST were more likely to have a feeding tube (p<0.001). The comparison of levels of dysphagia recognised by V-VST and WST. All patients failed water test had a V-VST. Among them, 20 out of 79 were identified to have safe and effective swallowing capability. Twenty had only impaired swallowing safety and 10 had only impaired swallowing effectiveness. 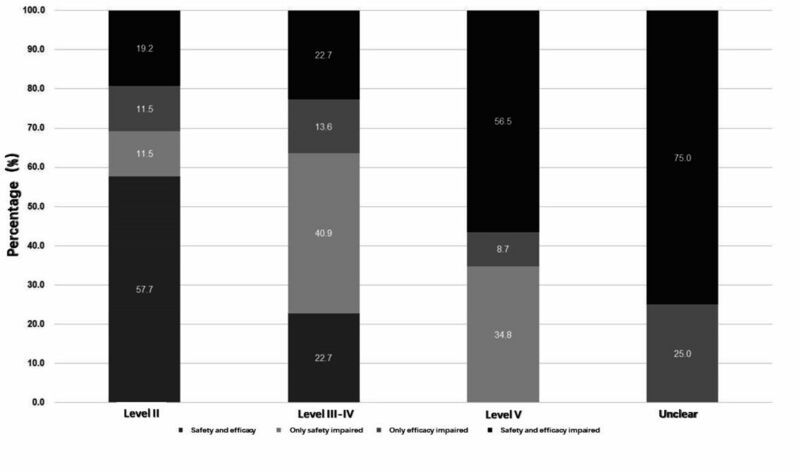 Patients with impaired safety or effectiveness received adjustment their food viscosity. Furthermore, all patients with unclear results on water test received a V-VST and their level of dysphagia were identified. V-VST, volume–viscosity swallow test; WST, water swallow test. Compared the recognizability of these two tests, V-VST provided more information of dysphagia, including not only the information on the severity of dysphagia, but also the strategy of management. Even part of patients who failed WST would be suitable for other viscosity of diet. Dysphagia was known as a high risk of developing poststroke pneumonia, however, there was limited evidence showing if placing a feeding tube could prevent post-stroke pneumonia. As secondary outcome in our study, 163 of 276 patients were diagnosed with post-stroke pneumonia by CT scan or X-ray at discharge. The rate of pneumonia was higher in patients with more severe strokes (figure 3). 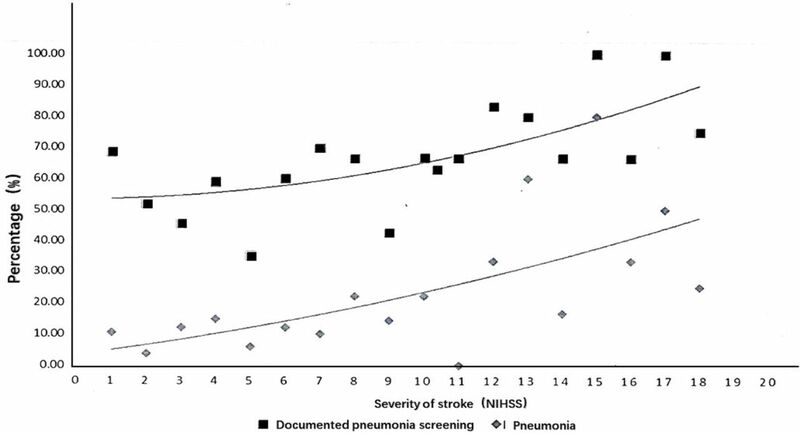 The frequency of documented pneumonia and risk of pneumonia by stroke severity on screening. The screening frequency of documented pneumonia (solid line) and risk of pneumonia (dashed line) by stroke severity (only ischaemic stroke patients were included). Among them, 137 out of 230 patients had a pneumonia screening during their hospitalisation, and only 37 patients were diagnosed with CT scan or X-ray as having a pneumonia at discharge. The more severe the stroke, the higher the risk of pneumonia in these patients. However, the screening frequency of pneumonia also was increased due to the severity of stroke. We examined the sensitivity of predicting pneumonia by WST and V-VST by comparing the V-VST test results in patients with or without pneumonia (table 3) and if they had feeding tube. Both tests showed good predictive ability in patients with pneumonia even some of them had feeding tubes (p=0.001 in WST and p<0.001 in V-VST). Since our study was an observational study, patients with mild symptoms did not have a routine lung CT and some patients with worsening neurological symptoms and unstable vital signs did not have a routing CT of lungs either. In our study, both WST and V-VST were identified as useful bedside dysphagia screening tools that could predict the risk of development of post-stroke pneumonia. However, V-VST was found to be more useful since it also provided more detailed information such as the severity and the management options of dysphagia, compared with that of WST. V-VST deals with the dysphagia problem more precisely in patients with acute stroke patients at bedside. Nearly every stroke patient can be tested by V-VST since it focuses on swallowing problems in only those with impaired mobilisation and coordination. Compared with WST, it can also be administrated by nurses and reduce the rate of placing a feeding tube in patients who can tolerant any diet. Although in our study, V-VST did not show significant difference in predicting pneumonia, a comparative interventional study should be conducted in the future. In our study, we mainly explored the implication of V-VST in patient with acute stroke. Our study has several limitations. We only compared the results of V-VST to that of WST, but not to the results of VFS. VFS is not available and affordable in most of stroke centres in China and it is not a bedside test. Second, only 79 patients had both WST and V-VST in 276 enrolled patients. This relatively small number of subjects can bring bias to comparative assessment. One advantage of our study was the self-control. There was no need to do the tests to others without dysphagia for the reason of comparison. In a multiple-centres open-label interventional trial, the implication of V-VST might reduce not only these complications, but also reduces length of stay and overall healthcare expenditures. In our study, V-VST provided more detailed information on the severity of dysphagia, compared with that of WST. Therefore, it meets the requirements as a bedside clinical screening test for dysphagia in patients with acute stroke. Furthermore, V-VST may be more useful since it help in guiding the management of dysphagia.
. National clinical manual for management of dysphagia and nutrition after stroke. Chinese Journal of Stroke 2017;12:951–67.
. Screening tests in evaluating swallowing function. Japan Medical Association 2011;1. TY and SH contributed equally. Contributors QD designed and draft the protocol. TY and SH performed the study, collected and analysis the data and draft the manuscript. YD designed study and revised the manuscript. They have participated and approved the protocol after revision. Funding This work was supported in part by the foundations from Fudan University (FNF201726). Competing interests All interventions were sponsored by Nestle Health Science. Otherwise, the sponsor does not play a role in the study design, data collection, data analysis, data interpretation or data reporting. There is no other conflict of interest. Ethics approval The Ethics Committee of Huashan Hospital, Fudan University. Data sharing statement Data are available by contacting the corresponding author. Correction notice This article has been corrected since it was published Online First. The affiliations were numbered incorrectly.